In 1999 Isabel Vasseur configured an art and architecture strategy for Kielder Forest Northumberland, now known as Kielder Water and Forest Park. One of Britains’ more remotely located National Parks, Kielder Forest’s management wanted to open up to provide for visitors that would bring the natural environment of the forest and nature reserve to the attention of a broader public and to attract visitors year round. Part of that visitor provision entailed commissioning a variety of young architectural practices to design shelters that would be used by visitors in several locations in the forest. While Isabel did not directly commission the new buildings, or indeed the art commissions, this project shows a compelling example of how a structured, creative initiative introduced at a crucial moment can have a hugely beneficial influence upon an organisation and its development over a significant period. One of the first installations at Kielder Forest, the Kielder Column has become part of the landscape. It was one of the first of thirty-five projects, commissioned over twenty-five years by Kielder Water & Forest Park as it matured and became a fully formed park with guided walks and an events programme that includes access to a collection of twenty site specific visual art and architectural installations. The Kielder Forest art initiative began in earnest in 1995. Isabel was aware of what the organisation was attempting to do and the role for art envisioned for this remote spot, right from the outset. 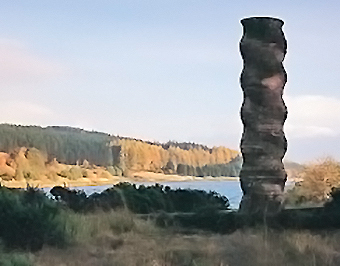 Her connection with Kielder Forest was made when ‘Kielder Column’ by John Maine RA, originally commissioned by Isabel for the National Garden Festival Gateshead in 1990, was brought to Kielder Forest after the garden festival site was dismantled and the work dispersed. Julia Barton’s ‘shadow’ installation, that encompasses local whinstone sandstone and earth to mimic a shadow of the hillside where none should be; taking advantage of a spectacular viewpoint you will find a shiny steel wedge-shaped shelter ‘Kielder Belvedere’ by Softroom Architects; acclaimed artist James Turrell’s light installation ‘Kielder Skyspace’ is a place of contemplation; John Maine’s hand-carved stone sculpture ‘Kielder Column’ is a soft barley sugar twist of pink stone; Tania Kovats installation ‘Viewpoints’; Studio Weave have left their mark with two shelters, ‘Robin’s Hut’, a hut-like structure on one shore of the lake and ‘Freya’s Cabin’ a cabin with internal forest motifs facing it on the other; Chris Drury’s reflection upon the qualities of Kielder Water ‘Wave Chamber’; Fiona Curran’s ‘The grass seemed darker than ever’; Wolfgang Weileder’s minigolf course ‘Mapping’ and ‘Hide’, a recently built wildlife watching space at Bakethin, a collaboration with Newcastle University’s School of Architecture as part of Kielder’s Testing Ground programme. There are several more installations along the art and architecture trail and new ones are being added all the time. For more up-to-date information click on the link to Kielder Water & Forest Park below.